Every web application is in need of navigating between its pages. React doesn’t come with its own routing library. But React community has built many routing libraries, React Router being the most popular. 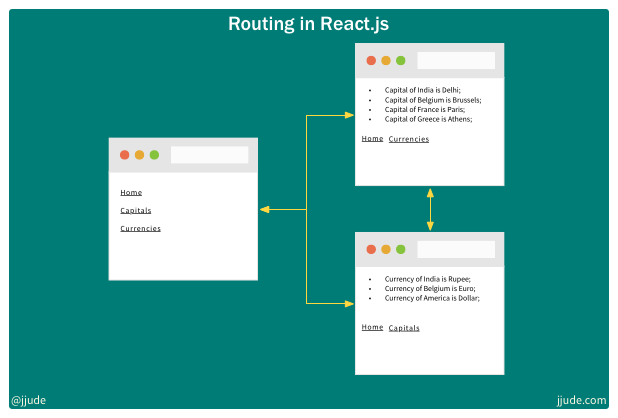 In this article, we will build a simple React application using React router. The homepage links to two other pages, capitals and currencies, and each of these pages link to home and the other page. This is in continuation to the earlier article—Rendering an array of data with React.js. We will use similar arrays of data to display capitals and currencies. Let us start with creating a React app. For this we will use the standard create-react-app command. In your terminal issue this command: npx create-react-app router. This will create a new react app in a folder router. You can go into the folder and start the development server with npm start. It will start the server and open the application in the default browser. Since we have installed all the necessary modules, let us start coding our routing application. Let us start with the Home component. As you see in the screenshot, the home screen contains three links — Home, Capitals, and Currencies. In HTML, they will all be anchor tags with a href linking to the pages. If we use anchor tags, it will cause the whole page to refresh, which is not what we want. React Router has a Link component for this purpose. As its name says, it links to pages within the application. Link component is the simplest component of the Router library. Currency and Capital components are copied from the earlier article, Rendering an array of data with React.js, with just one change. There is a Link component at the end of these components. We will also code a NotFound.js, which will just display a not found message for non-existing url links. It is also a functional component. exact: it tells if the path has to be exact. Router has a Switch component that goes through list of paths and render the first path that matches. We use Switch, because if none of the paths matches we want to display the NotFound component. Since this is a web application, we will use BrowserRotuer component. It makes uses of HTML5 history API, so that when you navigate the history is pushed into the browser history. You can click back and forward buttons of the browser to navigate. If you have the developer server running, the app will automatically update itself. Otherwise, you can see the result by starting the development server with the command npm start.